FOOTY fever came to Ivanhoe a century ago when the district’s energetic townsmen decided to form their own football club. Local sportsmen met in the schoolroom of St James Church of England in Ivanhoe on the night of April 11, 1910. According to a report in the Heidelberg News, (below left) there were 25 founding members and a steering committee was appointed. The Rev James Wilson was elected interim chairman, Frank Holt was secretary, and R.Boese, was treasurer. “The meeting decided that the name of the club should be the Ivanhoe Football Club, and a committee was appointed to select a playing ground,” the News reported. Social football matches against neighboring towns were the norm throughout the Heidelberg district during those formative years. Ivanhoe lined up for their first match on May 14, 1910, against Clifton Socials. 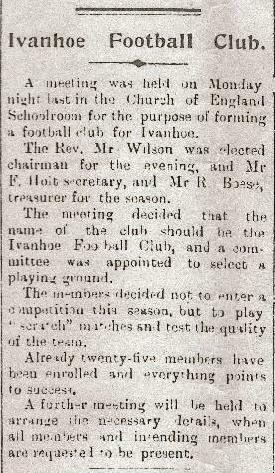 The News recorded that Ivanhoe were defeated “after a hard fight against a far superior team”. The final scores were Clifton Socials 13.16 to 5.5, with the Hoes scoring four goals to one in the final quarter. They were quick learners those Ivanhoe lads because the following weekend they rolled Alphington 10.14 to 3.5 at Ivanhoe. The local scribe noted there were plenty of spectators for their next outing against North Carlton Baptists, including “a number of ladies”. The Bryant brothers excelled in Ivanhoe’s 37-point win. Fred Bryant, who had played footy and cricket with Richmond District, kicked three goals and brother Bill got two. But it was a local derby between Ivanhoe and Heidelberg on July 31 that really sparked football tribalism in the district. The News printed a lengthy preview, which observed that Ivanhoe had recruited several noted champions and that the Bergers hadn’t lost a match in 12 outings. “When Ivanhoe meets thee in battle array. A big mob of spectators turned up for the game at Heidelberg Park and there was plenty of partisan barracking from men and women. A report for the Heidelberg News by “Rover” noted that “people would have been pleased to see their respective side win at practically any price”. There were cat calls of “Oh you big Ivanhoe coote” and Ivanhoe fans taunted the Bergers with lines like “the boys from sleepy hollow”. It was a willing and scrambly affair, but Heidelberg ran out comfortable winners 10.7 to 5.9. “Rover” wrote that it was time a district football competition was formed “for the physical betterment of this and other generations to come”. A key driving force behind Ivanhoe football club’s formation was the residents’ desire for a proper sports ground. The Ivanhoe Cricket Club had been formed in 1906 and its members played on open space where the town hall was later built, and also on land in Ford Street. But neither venues were deemed suitable. The Ivanhoe-Alphington Progress Society had lobbied hard for “a large open reserve for the people”. A progress association meeting on April 23, 1910 was told Heidelberg Shire Council needed 3000 pounds to acquire land for reserves in Ivanhoe and Alphington. A government grant was sought for half the money and a report to council stipulated that an Ivanhoe reserve had to be at least 15 acres, with ornamental trees and “nicely laid out”. About 60 ratepayers met in the public hall on May 5 and a man named Davis suggested land on the Chelsworth Estate on Lower Heidelberg Rd would be ideal because of its close proximity to the station, road access, and water. A five-man committee was formed to make a site inspection and report back at the next public meeting on May 10. The land was available at 120 per acre and ratepayers unanimously accepted the recommendation to push ahead. On March 11, 1911, the News reported that council had agreed to buy 13.25 acres of the Chelsworth Estate at 1500 pounds for a recreation reserve. Ivanhoe Park was born and the cricket club moved there for season 1911-12. On March 9, 1912, it was announced that Ivanhoe Football Club would join the HDFA. Mr W Carruthers, who had helped select the home ground, was elected president, E.F Lavender was secretary, A.E Oakley treasurer, vice-presidents were F.W.Gilbert, Fred Bryant Sr, Mr Gough and Dr Adam, committeemen Mr Neale, S.Henderson, and G.Baird. Subs were fixed at three shillings and sixpence, and club colours were going to be green and gold. 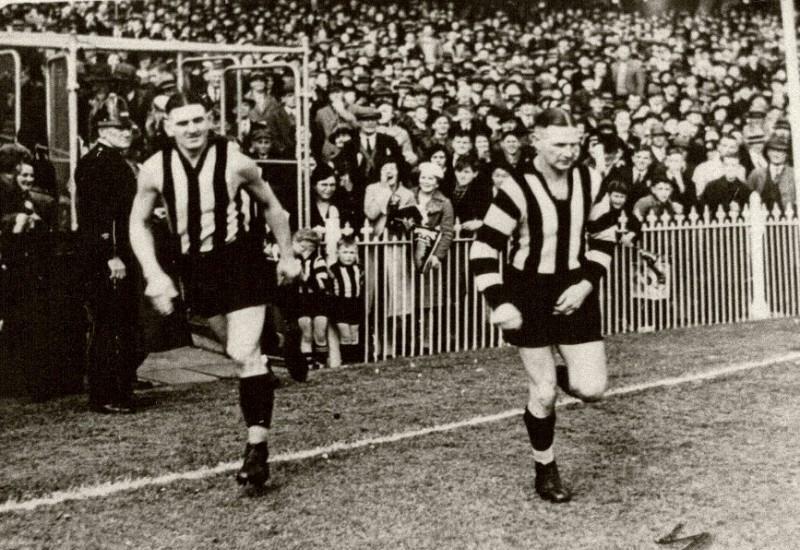 But at a players’ meeting in late April, Collingwood’s black and white strip was adopted instead, possibly because of a jumper clash with Greensborough who wore green and white. The Ivanhoe Magpies lost the 1912 Grand Final to Heidelberg, 6.11 to 5.10. But the following year they won their first flag, beating Fairfield in the wet in front of about 500 spectators at Heidelberg Park, 4.10 to 1.8. The Hoes popular captain and centreman Albert Colechin was carried triumphantly into the pavilion. He was the first of a long line of Ivanhoe players to be recruited to Collingwood and other VFL clubs, including the teenage Collier brothers – Harry and Albert – who went to Collingwood and become the only brothers to win Brownlows. Ivanhoe rejoined the HDFA in 1920 and won their second flag in 1921 against Heidelberg, 13.19 to 4.9. The Heidelberg league was disbanded and in 1922 most clubs joined the newly formed Diamond Valley Football Association (later known as the DVFL, forerunner of the present day Northern Football League). Ivanhoe joined the higher profile Melbourne District Football Association, which was later re-named the Victorian League Sub-District Association. Ivanhoe had to change colours though, and switched to the two blues which was dark blue with a pale blue vee. Albert Collier (left) and brother Harry run out for Collingwood. Harry won Ivanhoe’s B&F in 1924. The Collier boys were taught well at Ivanhoe. The club’s first professional coach was appointed in 1923. Ernest “Snowy” Lumsden (pictured below left) was a former Collingwood vice-captain who had played in the 1917 and 1919 premierships. Harry Collier won Ivanhoe’s best and fairest in 1924. He played 253 games for the Pies between 1926-40, captained between 1935-39, played in six premierships, won two best and fairests, and was awarded a retrospective Brownlow for his 1930 season. Albert played 205 games for Collingwood, won three B&Fs, played in premierships 1927 to 1930 and 1935-36, and won the 1929 Brownlow. Ivanhoe joined the Metropolitan Football League in 1934, which later became the Victorian Amateur Football Association. The club reverted to their original black and white strip in 1936.